Kou Tenka is a disciple at Konron, and Kou Hiko's second son. 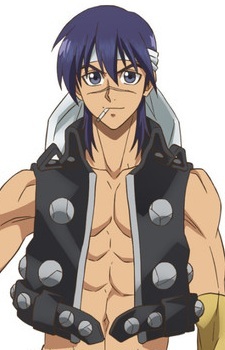 One of the Juunisen, Seikyo Dotoku Shinkun, discovered and recruited him as a doushi. He has his father's upstanding spirit and fighting skills, but his mother's black hair. He uses the inflection "-sa" at the end of a sentence, and is always smoking a cigarette. He is master of the lightsaber like paopei, "Bakuya no Hoken," and later receives a fire-emitting, boomerang paopei called "Karyuhyo," and the tiny lightsabers "Sanshintei." After the sennin battle at the Kingou he received his master's "Bakuya no Hoken 2," which has a blade on either side of the handle. Because of his absolute self confidence in close combat, and too much of a warrior's spirit, he extremely hates to lose. He has a rough attitude and would jump to conclusions. As a result of a cursed wound received from one of Chou Koumei's youkai sennin subordinates, his life was shortened. He fought Chuuou in order to surpass his father and avenge his parents, but the moment he defeated him, he lost his resolve. Immediately after, he was run through by the sword of a nameless soldier and got hoshined. However this does not apply to 1999 anime as he was not wounded by a cursed sword and survived in the end.